Today’s post comes to you from Sarina’s Sephardic Cuisine. Sarina and team recently returned from vacation in Morocco on a culinary adventure in their home country. Cuisine from the Near East and Iberian Peninsula certainly is as to be as rich Judaism is in tradition and they are applying their knowledge and culinary favorites to create a Sephardic cooking app. The app will launch later this year and includes videos to guide you through the cooking process. This isn’t the first time I have shared Beer Can Chicken with you, but this dish has a a great blend of flavors which differs from the rub I used previously. 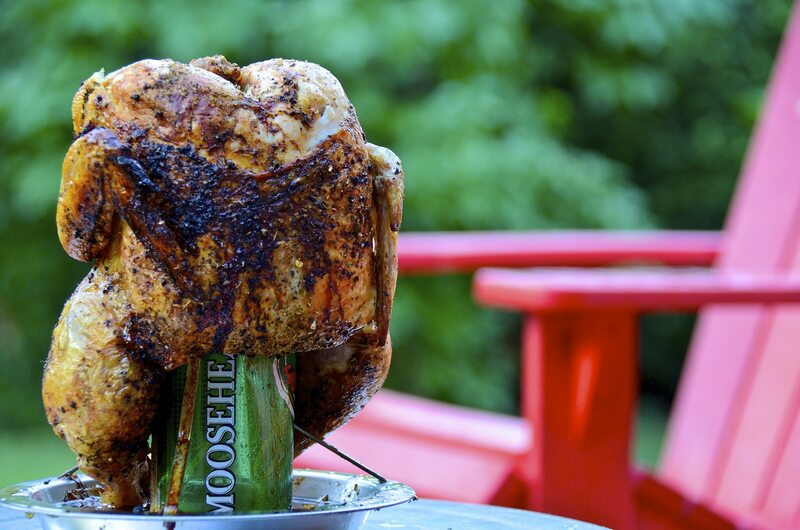 You can stand your chicken on the beer can itself, or opt for something like this that includes a drip-tray. This is the beer can chicken stand that I own and use. Mediterranean cooks are culinary experts in the art of grilling. The dry weather allows for unlimited outdoor cooking, so kabobs of all sorts including chicken, chopped meat (like burgers on a skewer), cubed beef and of course, veggies, are standard fair. Grilling is more of an art and takes more time than simply throwing burgers and hot dogs on a grill and saying you are having a barbecue. Grilling takes more loving care and involves slower cooking to bring out the natural juices of the meats. Grilled Beer Can Chicken is an example of a mouthwatering and incredibly moist way to prepare poultry and when we cook for Sarinas Sephardic Cuisine, we serve it with a Mediterranean couscous, Zataar chips and an easy veggie kabobs. This is a great menu for a make-ahead meal! For the Grilled Beer Can Chicken, use a whole chicken seasoned with a rub made up of salt and pepper, paprika for color, oregano, thyme and basil. Then take a can of beer and make extra holes at the top of the can. Empty out about half of the beer and fill it with mint leaves, rosemary, thyme and mashed garlic. 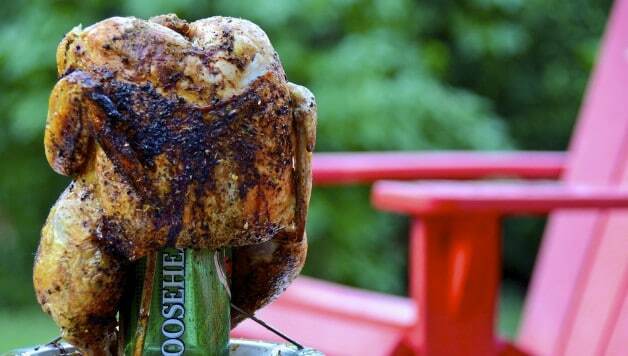 Place the beer can open side up inside the chicken cavity. The chicken will stand up on the beer can on the grill. It can be tricky to balance the chicken on the can. I also find that a dark lager gives the best flavor. Grill the chicken slowly and as the beer heats up, it overflows inside the chicken, resulting in a moister chicken. The chicken takes a little over an hour to cook through and is definitely worth the cooking time. When it’s done, we pour the beer into the bowl with the chicken and use it as gravy. The alcohol has been burned off and it’s absolutely delicious. This recipe has become a favorite in our house and we usually make 2 because it goes so fast. The chicken can cook while the table is set and the other preparations are being made. Don’t leave out the typical hot dogs and burgers as people do love them. Ante on your menu with our colorful veggie kabobs. Just take an assortment of veggies – green pepper, onion, summer squash, and cauliflower cut into bite size pieces. Thread them on a skewer, alternating the veggies so each one has a mix of colors. Kabob hint – if using wooden skewers soak them first for an hour to avoid burning. Make a simple dressing with olive oil, salt and pepper, and spices of your choice. We like mint and thyme. Pour it on the kabobs and they will be delicious when grilled. These only need about 10 minutes on the BBQ. Squeeze on fresh lemon before serving. Yummy! 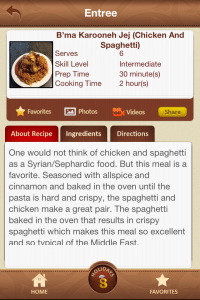 Sarina’s Sephardic Kitchen app will be available in late 2013.